Answer: Hi Barry,There is no safe way that I can answer these questions over the Internet. If you were in Philadelphia I could send someone out to inspect and work with you but doing it on your own is not a good idea. 1. 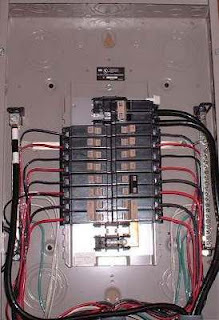 An electrical service panel installation is a job for a licensed electrical contractor. The buss bar in all residential electrical service panels is fed from the main breaker. Every other breaker is is on a different leg of your electrical service. Some where you must have a bad connection to the electric company or a bad main. To fix this you need to have training because on that side of the main breaker there are no safety devices built in to protect your life. Please hire an electrician. This is not a job for someone who is handy and thinks they can figure it out on their own. 2. The grounding of a steam shower is also something you should have a pro set up. It this is done wrong you could be placing someone in great danger. Wate r and electricity do not mix and grounding this type of electrical system is extremely important. You must also have it protected with a GFCI circuit. The short answer is ground everything. Your electrical panels has a ground bar that attaches to the cold water pipe. All motors and control boards need to be tied back into this circuit. You can't over ground you system so if in doubt ground it again. I really hope you call in an electrician for this work. Electrical safety is not something you should learn on the job.